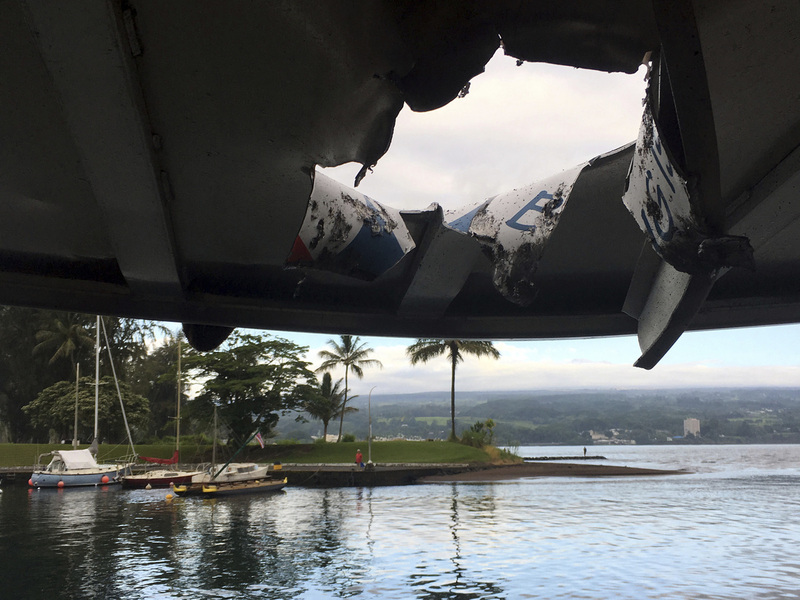 Hawaii: Kilauea 'Lava Bomb' Hits Tour Boat; Explosion Injures 23 A basketball-sized lava bomb slammed through the roof of a tour boat near an active fissure of the Hawaiian volcano early Monday morning, showering the vessel with debris. A tour boat was damaged and 23 people injured when lava crashed through the roof of the vessel off the Big Island of Hawaii Monday. A basketball-sized lava bomb slammed through the roof of a tour boat near an active fissure of Hawaii's Kilauea volcano early Monday morning, showering the vessel with debris and injuring 23 people, according the Hawaii County Civil Defense Agency. Officials described the incident on Facebook writing that an explosion off the coast of Kapoho hurled several lava bombs onto the boat — called Hotspot — at about 6 a.m. local time. "[Four] passengers taken by ambulance to the hospital, one seriously injured with a fractured femur. Most other injuries were superficial," the post read. Hawaii News Now reported a woman in her 20s suffered the fractured femur and was in serious condition. The other wounded passengers were being treated for burns and scrapes. All were attended at Hilo Medical Center. The boat is one of two owned by Lava Ocean Tours, a company whose website promises adventure seekers that they can "See, Hear & Feel the heat from your front row seat." Kilauea's ongoing volcanic eruption has swallowed up entire communities — an estimated 700 homes have been destroyed — and reshaped large swaths of the Big Island since May 3. In fact, on Friday, geologists confirmed that lava flows entering the ocean from one of the most active fissures had started to form a small island off of Kapoho.